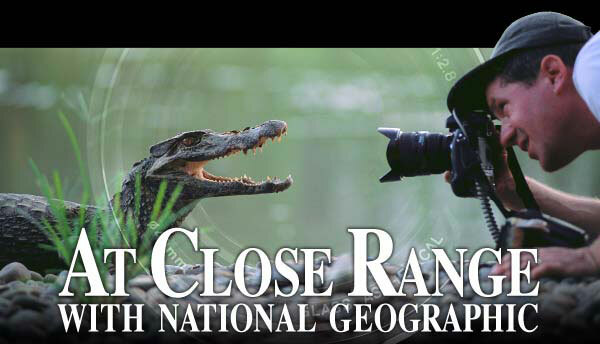 National Geographic photographer Joel Sartore shoots in some of the most exotic locales on earth, but often in wretched conditions for weeks on end, and always under pressure to produce pictures worthy of publication in a legendary magazine. A devoted husband and father of three, he often wonders if it’s the best job in the world, or the worst. At Close Range with National Geographic provides a rare glimpse of the havoc a tough, dangerous job can create for one’s personal life, especially for someone like Joel Sartore. On the job, Sartore has been chased by bears, wolves, alligators and musk oxen. Recently, as he watched an anaconda seize an egret in the Pantanal of Brazil (observing how he “could hear the bones of the bird giving way in small muffled explosions as it was crushed to death”), the eight-foot snake turned and struck at him, but missed. The film features interviews with National Geographic photo editors in Washington, D.C. – the people who painstakingly edit 30,000 to 40,000 individual frames down to the 10 to 20 that appear in a typical magazine story. The film also takes a probing look at this photojournalist in his own backyard. At once charismatic and deeply revealing, Sartore and his family create a dramatic and poignant sub-plot which leaves its audience pondering large, philosophical questions about marriage and fatherhood. At Close Range is the story of a remarkable, exceedingly funny, and strangely modest internationally-acclaimed photographer – a person who adores his home state and wants nothing more than to save the world. Joel Sartore reminds us of where we fit in the cosmos, and what we owe to the next generation of all the earth’s inhabitants. Besides the work he has done for National Geographic, Sartore has completed photo assignments for Time, Life, Newsweek, Sports Illustrated and numerous book projects. Sartore and his work have been the subject of several national broadcasts including National Geographic’s Explorer, the NBC Nightly News, NPR’s Weekend Edition and CBS Sunday Morning. At Close Range with National Geographic is a production of NET Television. © 2006 NET Foundation for Television. All Rights Reserved.